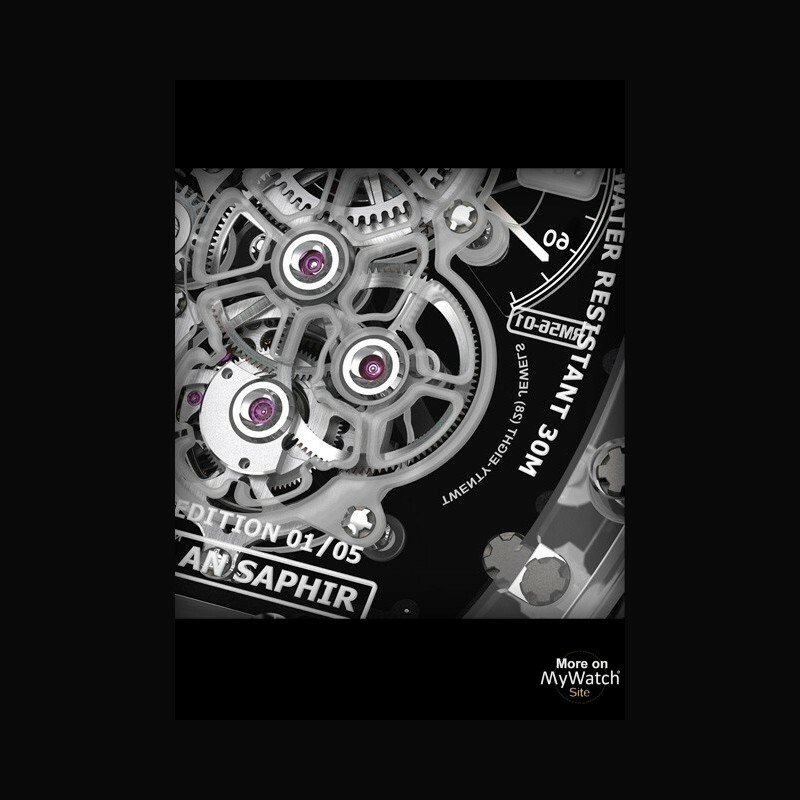 Price request for RM 56-01 Tourbillon SaphirRef. The entire case - front bezel. caseband. back of the RM 56-01 are cut and milled from solid blocks of sapphire. No external structures are used to support the assembled parts. Sapphire is known as a particularly scratch-resistant material with a hardness of 1800 Vickers. Made of aluminium oxide (Al2O3) crystals. it is transparent thanks to its molecular composition. exceptionally delicate. 1000 hours of machining. of which 430 hours were spent on pre-forming the case components and 350 hours on polishing the whole watch case. For excellent optical properties. the front bezel and the back bezel have been treated with an anti-glare coating. The tripartite case is water resistant to 30 meters. ensured by two Nitril O-ring seals. The case is assembled with 24 spline screws in grade 5 titanium and abrasion resistant washers in 316L stainless steel. 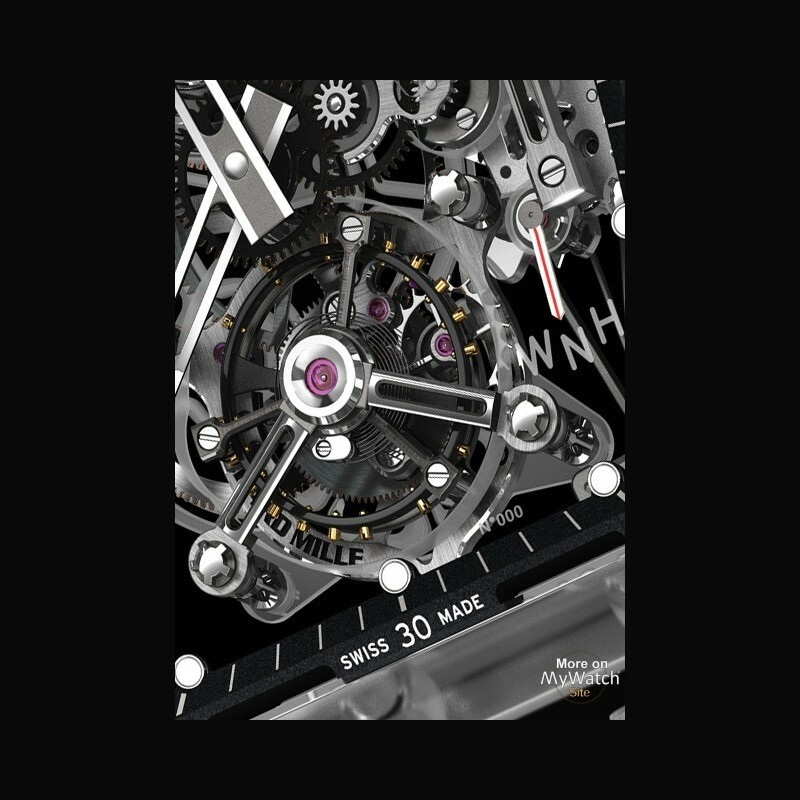 When it was unveiled at the 2012 SIHH, the RM 056 split-seconds competition chronograph sapphire, a limited edition of 5 timepieces, caused a shock-wave in the watchmaking world with its pared down purity, its movement with exemplary finishing and its case made entirely of sapphire crystal. 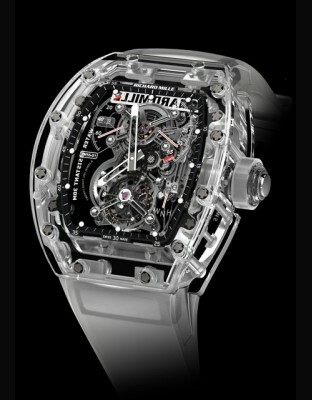 This watchmaking revolution has elevated the Richard Mille brand to an unrivalled level of design and innovation. Following this technical feat and determined to continue challenging the very limits of fine watchmaking, Richard Mille has created another exceptional piece for 2013: the RM 56-01 Sapphire Crystal. The brand used its immense experience of skeletonisation and of making components in sapphire crystal (Al 2O3), gained during research for both the RM 018 «Homage to Boucheron», which has a double baseplate in this material, and the case of the RM 056 for the creation of the RM 56-01, characterised by its extraordinary transparent movement. 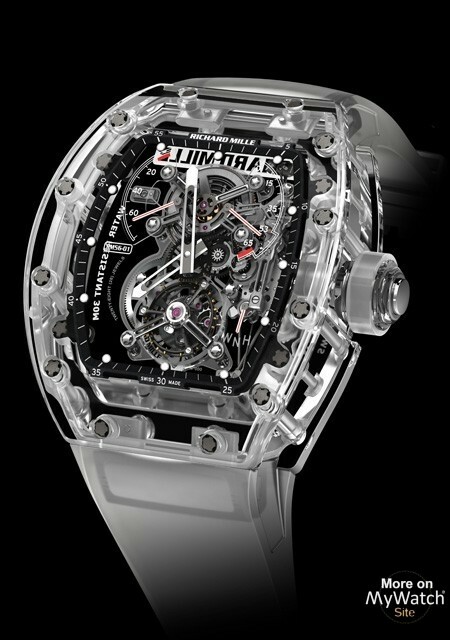 By using a sapphire crystal baseplate – which supports the entire manually wound tourbillon movement – Richard Mille allows as much light as possible to penetrate into the caliber RM56-01, which displays the hours and minutes, with power-reserve and torque, at 11 and 2 o’clock respectively, and a function selector indicator at 4 o’clock. This quest for extreme transparency at the heart of a titanium movement also led the engineers to use sapphire crystal for the central bridge and third wheel. The caliber RM56-01, made from sapphire crystal and titanium, is immune to temperature variations and wear, ensures excellent stability and offers exemplary chronometric performance. Its three-part case is inspired by that of the RM 056, with each component – front bezel, caseband and back bezel – machined and ground from a solid block of sapphire crystal. Machining operations lasting for over 40 days, 24 hours a day, are required to produce one case. In order to machine it, a specialist CNC machine had to be purchased especially for the RM 56-01. All the components made from sapphire crystal were machined by the world specialists in this material, Stettler, located in Lyss, Switzerland. This case, which sits perfectly on the wrist, is water-resistant to 30 metres thanks to two O-ring seals in transparent Nitril, and is fixed around the caliber RM56-01 using 24 grade 5 titanium spline screws. Its strap carries the concept of transparency to its apogee. 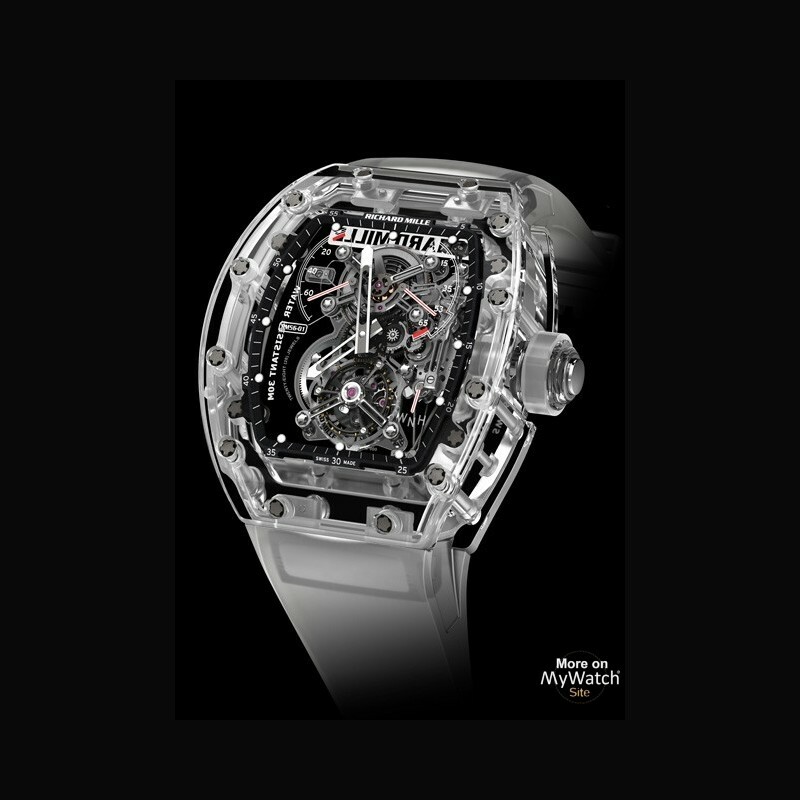 Collaboration between Biwi SA and Richard Mille has made it possible to develop a material, Aerospace nano®, that employs nanotechnology to obtain unequalled transparency and strength. 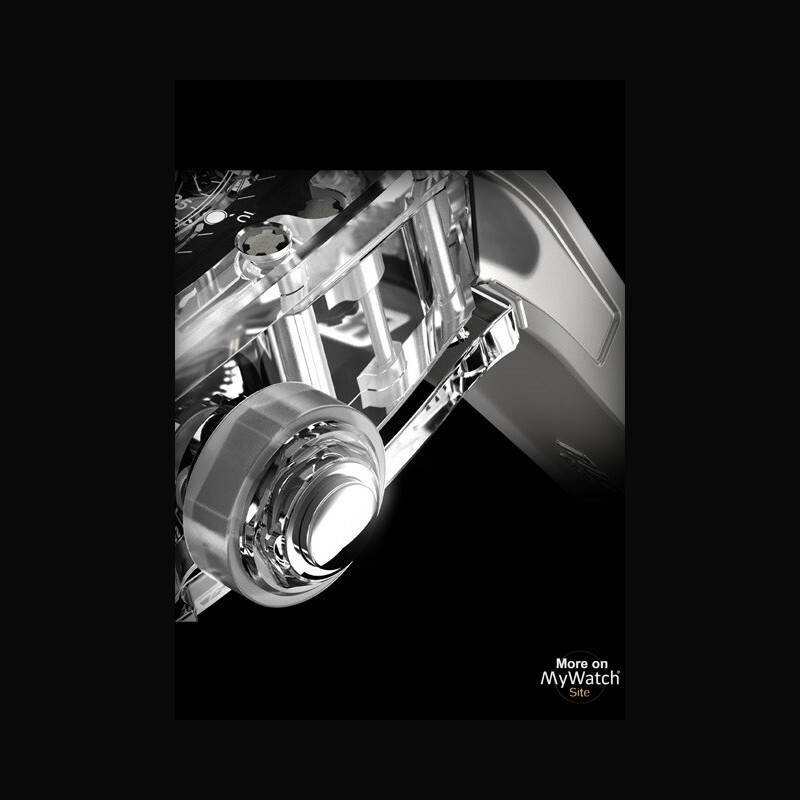 The nano-reinforcements in this material, which has never been used in watchmaking before, are generated in situ during the manufacture of Aerospace nano®. Its elastic and waterproof properties make it silky to the touch and superbly comfortable. The strap of the RM 56-01 alone inaugurates a new class of materials in watchmaking. The RM 56-01 Sapphire Crystal symbolises all the expertise Richard Mille has accrued in showcasing a caliber through its sheer transparency. Because the machining of sapphire crystal is an extremely difficult process, the RM 56-01 is only available in a very limited edition of 5 timepieces. 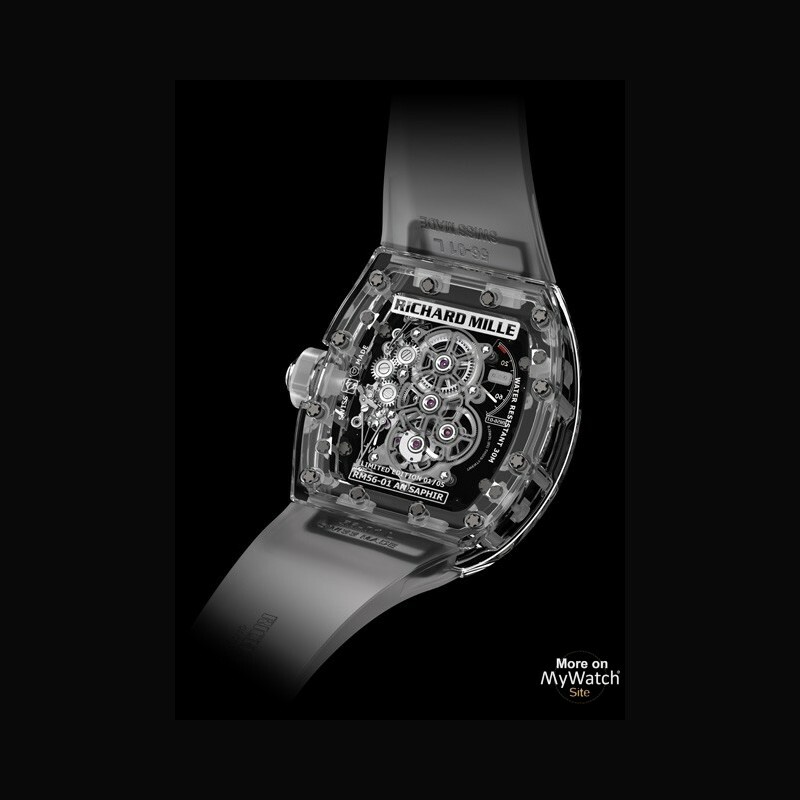 In 2001, Richard Mille created the first watch in the collection: the tourbillon RM 001. This exceptional, efficient timepiece, which refuses all compromise and artifice, and features the hand-applied finishes required by very fine watchmaking tradition, helped define the values of the brand and laid the foundations of a new millennium in watchmaking. Eleven years later, the range is composed of almost 50 models, all designed, developed and produced by the Richard Mille brand. 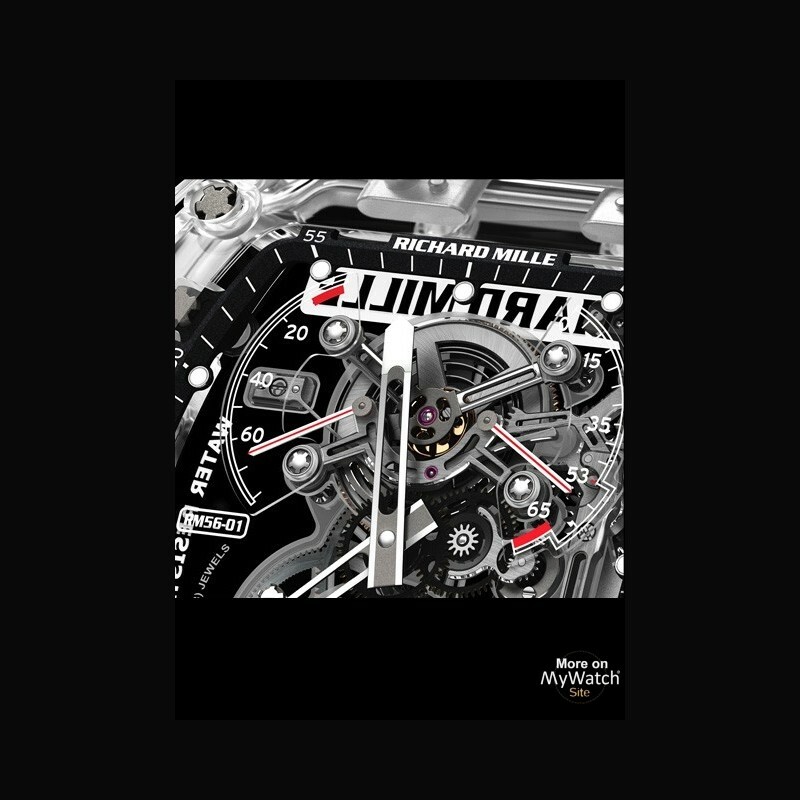 From tourbillon calibers to automatic movements, Richard Mille timepieces translate a watchmaker’s vision of various industries, such as automobiles, sport, aeronautics and sailing. 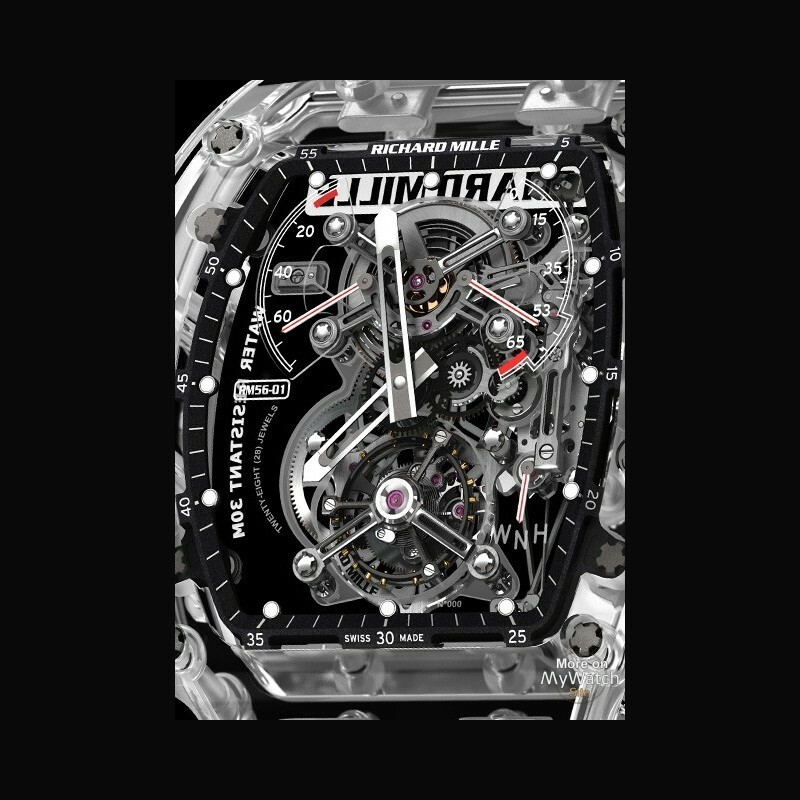 Richard Mille has decided to rethink the names of his watches in 2013 in order to classify them in families according to their characteristic themes and complications. For example, the models in the RM 011 family, all automatic sport watches equipped with a flyback chronograph, will be renamed the RM 11-01, RM 11-02, etc. Meanwhile, those in the RM 056 family of tourbillon calibers featuring sapphire-crystal cases will henceforth be known as the RM 56-01, RM 56-02, and so on. These new names will also be extended to the brand’s new collections.